Over 1,100 children in Chicago’s impoverished North Lawndale neighborhood are under the care of the Illinois Department of Children and Family Services. 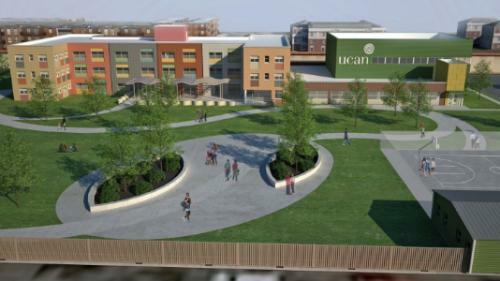 UCAN’s CITY (Chicagoland Institute for Transforming Youth) campus will include a therapeutic youth home specifically designed for wards of the child welfare system who have been abused and/or neglected and have histories of severe trauma. UCAN (Uhlich Children's Advantage Network) decided to locate this new facility near the population it serves in the South Side of Chicago. 71% of children in the North Lawndale area live in poverty. A second building for UCAN program offices will allow expanded outreach services to the community focusing on areas of youth leadership, violence interruption/prevention, clinical and counseling services, family support, and job readiness skills. Urban Partnership Bank – a CDFI, Minority Bank, and longtime NCIF partner – will act as a leveraged lender to this project, benefiting from the loan revenue and a promising new business relationship with UCAN. The bank will also gain hands-on experience with the New Markets Tax Credit program, which will strengthen its capacity for future projects.